Aerial Map pre-set-up Link below showing Cocoa Beach FL Restaurant locations. Print your own handy Restaurant Locations Map! The Cape Canaveral Port area is home to two of our favorite "on the Water" north Cocoa Beach Restaurants. Actually both waterfront restaurants are about 10 minutes north of Cocoa beach and "technically" in Port Canaveral -- but it is often referred to as the Cocoa Beach Port. The Cape Canaveral Port is an interesting area since is where some major Cruise lines including Carnival and Disney now dock some of their Cruise ships. Also several Gambling Cruise Ships and Fishing Charter Boats Dock there. Enter the Port Canaveral Restaurants area off of AIA Hwy on George King Blvd at the Stop Light on the bend as AIA turns west. Turn off of George King Blvd on Dave Nisbet Dr. to get to Milliken's and Rusty's -- turn off on Flounder St. to get to Grills and Fishlips. Glen Cheek Drive runs beside the harbor, and by all four waterfront restaurants listed below that overlook the Harbor area. Grills gets great "user reviews" from almost everyone on good food, service, and views, including us. 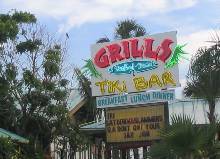 Grills is our favorite Restaurant in the Cocoa Beach Area - even for breakfast! To Grills Restaurant Web Site with Menu, Map, and Pictures of Views from restaurant Tip - Sometimes even a printable discount coupon! Share your own Cocoa Beach Area Favorite Waterfront Restaurant "Rave" or "Review" on This Favorite Cocoa Beach Restaurant Reviews Page. To Fishlips Restaurant Home page with Map and Menu links. Tip - Grills and Fishlips both have bands some days/eves - check their web site links for details. Reservations are a must at both in evenings. Grills & Fishlips are both Top area Cocoa Beach FL Restaurant "on the water" Picks. Good reasonably priced food, friendly service -- and great waterfront views! Grills even serves breakfast now. Just west of Fishlips above on the same street beside Harbor. Rustys and Grills are both very popular with the "locals," which should tell you something. Rusty's has more of a "Bar" emphasis than Grills, which may make it less appropriate for families. Good seafood at reasonable prices + good service. This link goes to the Rusty"s Seafood Oyster Bar web site with Menus, Specials, and hours. Another Cocoa Beach FL Restaurant favorite. (321) 783-0100 - About a block west of Rusty's Seafood Bar, above - about 2 blocks west of Fishlips on the rounded corner of Glen Cheek drive and Dave Nisbet Drive. West of both Fishlips and Rusty's on Glen Cheek Drive on the corner where it bends south into Dave Nisbet Drive. Great views of the big Cruise Ships docked in the Harbor -- or if you get lucky -- coming and going! Plus the small Fishing boats coming and going. You can sometimes luck out and see a Big Disney or Carnival Cruise ship head out to the ocean from the Port Canaveral Harbor about 4 o clock in the afternoon 2 or 3 days a week according to the "locals." Call and ask a hostess at Millikens Reef their best estimate of the day and time the next Cruise ship will come in or go out if you want a "ringside view" of the process. 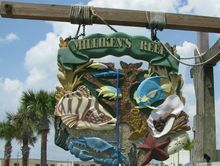 Millikens is now one of our Top Pick Cocoa Beach FL Restaurant choices for Lunch. 800 foot long fishing pier with many restaurants, bars, rentals, and shops plus beach access. Click on a red "teardrop" in the listing on the left to jump to that location on the map. Then double-click to the side of the base of the "teardrop" (NOT on teardrop!) to recenter the map. -- then click "+" to zoom in. Click "Hybrid" view to see Satellite View with a street map superimposed. Can see how close restaurant is to waterfront. Useful and fun. Tip - Remember that double-click on map re-centers it to that point. Can single click on map and then use keyboard arrow keys to more precisely move map around than "jump" arrows on map, however, double-click to re-center seems to be easiest to shift map when zooming in. Atlantic Ocean Grille on Cocoa Beach Pier is a good choice for a view of the Atlantic Ocean and Cape Canaveral from Pier high above the ocean. Atlantic Ocean Grille opens at 5 PM. Good Cocoa Beach FL Restaurant option. To Atlantic Ocean Grille Home page - click the "Restaurants & Bars" button at top for other Restaurant & Bar options at the Cocoa Beach Pier. Some recent "mixed" reviews on the Atlantic Ocean Grill, but are still leaving it as a Cocoa Beach FL Restaurant favorite. Coconuts is an oceanfront restaurant that is very popular "mingling" spot with the "locals." They have direct Ocean beach access (complete with sand rinse off shower) and occasional bikini contests, so seemed to have a fair number of bikini-clad customers the early afternoon we were there - and lots of guys checking out the bikinis. Coconuts on the Beach has inside dining and bar plus outside oceanfront dining and bar options. Some covered outside seating area. Live entertainment nightly plus daily food and drink specials. They have won some local awards. You can see some pictures of the beach view at the Coconuts on the Beach web site - the strip of beach in front of Coconuts appears to be a very busy area of Cocoa Beach! We had a late lunch there and found the food and service to be good, and the ocean view great. If you don't "mind" the bikinis (or your wife or girlfriend doesn't mind your occasional attention "drift" as one walks by), would rate Coconuts on the Beach as a Cocoa Beach FL Restaurant Top Pick for lunch. One of our Cocoa Beach FL Restaurant favorites for Riverfront on-the-water dining in the evening. The Lobster Shanty Restaurant overlooks the Banana River for beautiful riverfront sunsets and offers good food at reasonable prices. We have always received good service there. Check out their Early Bird Specials and hours at their web site link below. There is a large glass window area overlooking the big outdoor dining deck and River, plus a walkway out onto the river where you can see many pelicans perched on poles. Tip - There are some large schools of carp right next to the dock and a couple of vending machines with fish food that you can throw out and start a "feeding frenzy." Kids and adults loved it! This link goes to the Lobster Shanty Web site for Cocoa Beach. They are a chain and have several restaurants in several Florida and other locations. 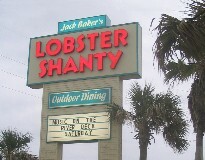 The Lobster Shanty is a definate family Cocoa Beach FL Restaurant Top Pick. You can come to Sunset Cafe by Boat or by Car since have boat dock on waterfront (west) side of restaurant and car parking in front or rear. Casual dining. Great view of the Intercoastal waterway and sunsets over the water. Inside dinining plus a large covered outside dining area. Early Bird meal specials, daily 4-6 happy hour + live entertainment in outside area. 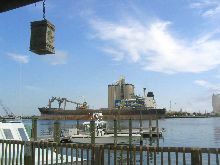 We had good food at reasonable prices + a great view of the Intercoastal waterway, later sunsets, and the boat traffic. We were too early for a sunset but just before the end of the early bird special time which ended at 6pm. The special was good. 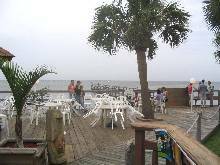 We would rate the Sunset Cafe Waterfront Grill and Bar as a Cocoa Beach, FL Restaurant Top Pick. Also see our nearby Cocoa Village Restaurant Top Pick page, plus an "On the River" favorite just south of Cocoa on Hwy 1. Drive west across the Intercoastal waterway over to historic Cocoa Villiage on Hwy 520 for some fun shopping before and after lunch + check out some interesting Historical Cocoa Village buildings (and a directory of shops). 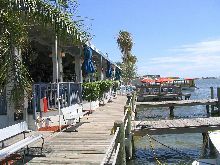 Then drive down Hwy 1 south of Cocoa a few miles for some relaxing evening waterfront dining on the Indian River. Some great Seafood Restaurant choices on our Waterfront Melbourne Florida Restaurant Top Picks page. 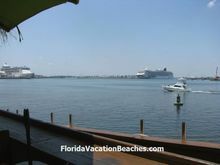 -- Also many Florida Cocoa Beach & Cocoa Beach Port / Port Canaveral area Discount Coupons! (However, don't let coupons make your selections for you as to what restaurants and attractions to visit - That is their intent, and often the "biggest" discount coupons go to the "worst" attractions and restaurants. Check out our Cocoa Beach Attraction "Reviews" and Tips for "pre-screened" Attraction, Point of Interest, and Cocoa Beach FL Restaurant ideas. Please send us any good "on the water" Cocoa Beach FL Restaurant Favorites, points of interest, or Attractions which you have discovered that are not mentioned here. Any good or bad experiences you have had with any of our area waterfront Cocoa Beach Restaurant listings would also be appreciated. Or, just send us your general Comments on our Comments, Suggestions, & Favorites Page. Thanks!